One of my most anticipated new releases for 2012 has been Bitterblue by Kristin Cashore. It has felt as though we have been waiting for this book for ages and ages. Last year Kristin came to Melbourne and I went and bought Fire and Graceling to get signed and the question on everyones lips was 'when will Bitterblue be out?'. Finally, that time has come. When I went to the library to pick this book up, I was really, really surprised at how big this book is. At nearly 550 pages, it is much bigger than both of the previous books but luckily I like big books. Not as much as I used to because there was a time that I bought my books based on how thick they were, but I am still happy to invest time into a big story and hopefully get lost in the pages. I wasn't quite so appreciative when I chose this to be my commute book over the weekend when I was going to the convention I was at and had to carry it around all day! Should have chosen a smaller book for that but never mind. 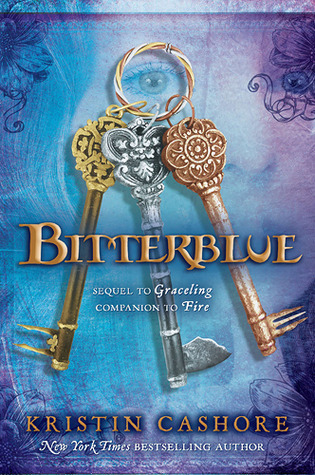 So far, I am enjoying the story although the reader is only slowly being drawn into what is happening in the book but to be fair, the main character, Queen Bitterblue, is only slowly finding out what exactly went on in her kingdom previously and what is going on in her kingdom now. "How is your puzzle going?" "Dreadfully," she said, grateful to him for remembering. "I have lords like Danzhol, who stole for Leck, connecting with thieves who are stealing the things back, connecting with a strange piece of misinformation about gargoyles my advisers gave me, connecting with other kinds of knowledge my advisers seem to prefer to discourage, connecting with knowledge the thieves would like to keep from me as well, such as why someone would stick knives in their guts. I don't understand the courtyard decoration either," she said grouchily, glaring at the shrubberies that a moment before had been delighting her. "Hm," said Giddon. "I confess, it doesn't sound very illuminating. "It's a disaster," Bitterblue said. "Well," said Giddon with mild amusement. "Your great courtyard is lovely in the rain." I am looking forward to reading more and getting lost in Bitterblue's kingdom when I get back on the train tomorrow morning! I am drawn by the title. Amazed that it is 550 pages long. I have Gracling but haven't read it yet - daughter di and she really liked it. It didn't feel like 550 pages (the type is big?) (the pages are small?). I finished this yesterday morning and enjoyed it. Not quite as much as Graceling, though. I'll have to add this one to the wish list for Kiddo. He's a big fan of Kristin Cashore. I've yet to get to her books. I'm fairly desperate to read Bitterblue I loved Graceling! I hope you are enjoying it! I read a fascinating story about the huge editorial effort behind this one--apparently the author submitted an 800 page manuscript that she then had to rewrite from scratch. Ouch! I read the first in the series and was sort of bored but I've been hearing good things about the entire set so I might have to go back and do a reread.